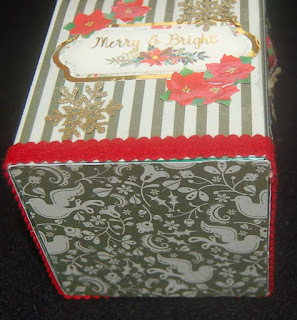 I found some striped card stock in my overflowing stash of Xmas papers and used it around the sides. 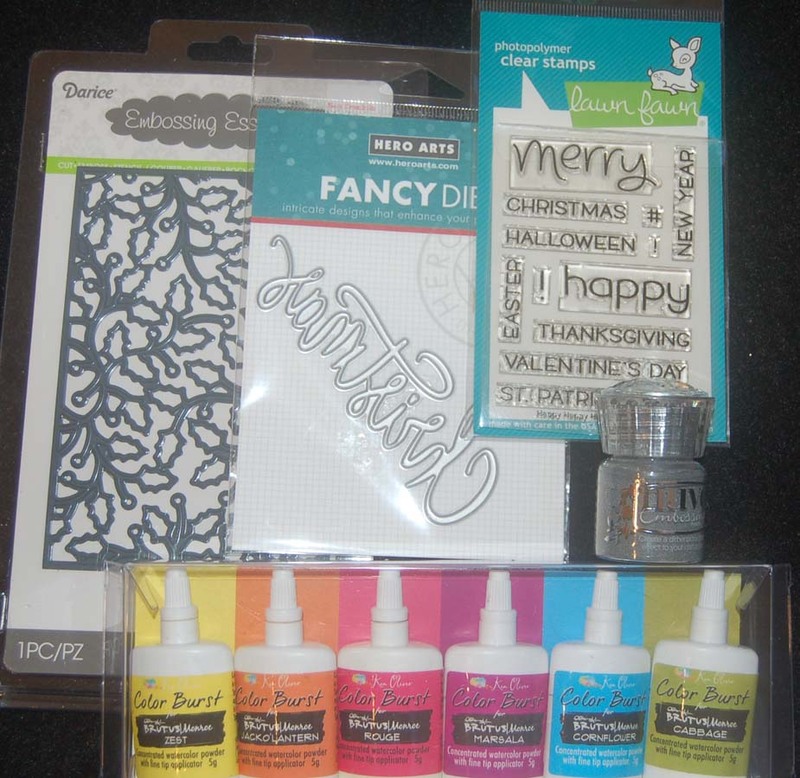 I added stickers, die-cut sentiments, sequins, and ribbons. It was so easy to turn a throw-away to a keeper, usable for holding my baked goods. 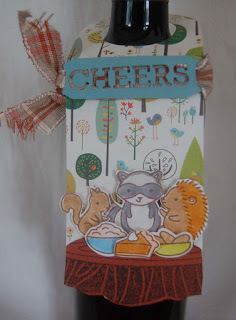 I even decorated the bottom with the reverse side of the striped card stock. 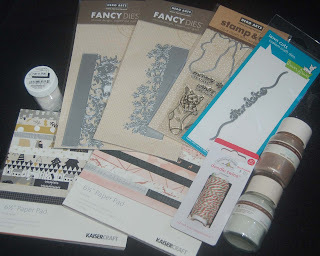 Most of the supplies used were from my seemingly bottomless Xmas crafting stash. 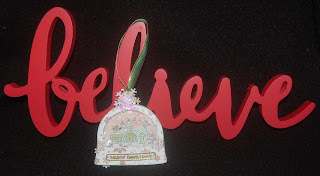 The scalloped felt ribbon is a Martha Stewart product and the green ribbon with gold edging is a Heiko item from Celebrations. I really like the gold glitter snowflakes from Sierra Pacific (sold at HM BFC)...there are so many snowflakes in that small vial! I hope that you will try upcycling your empty food boxes while you still have your Xmas supplies out. 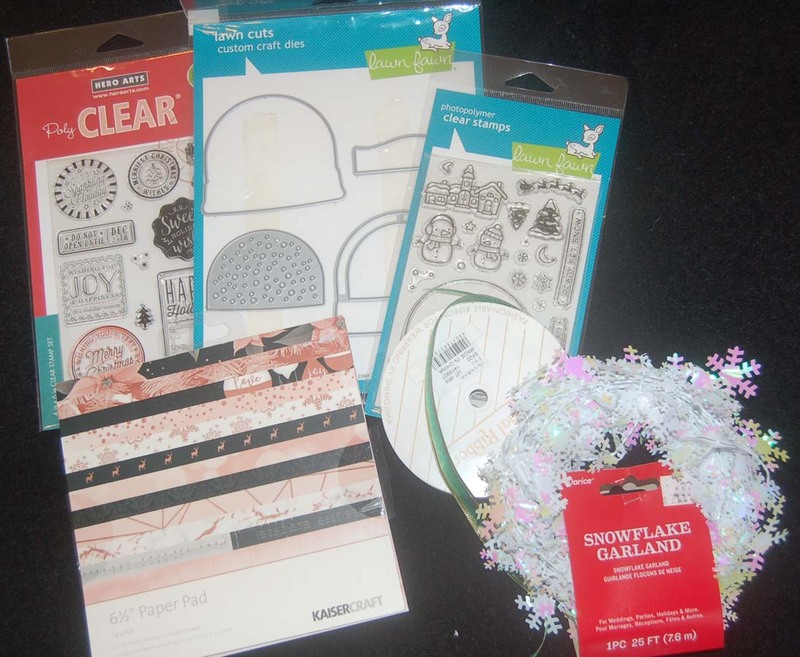 The holiday season will be rolling around again before you know it, so start decorating now. 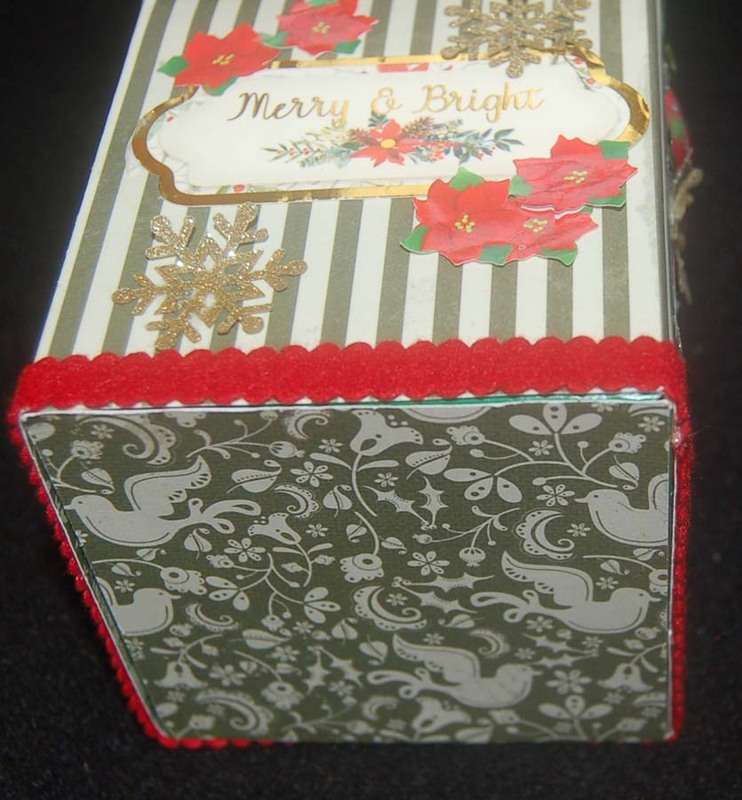 You'll be so happy next year when you find finished boxes, cards, and tags! I used the Hero Arts die to cut the 'Christmas' out of green foil card stock (DCWV). 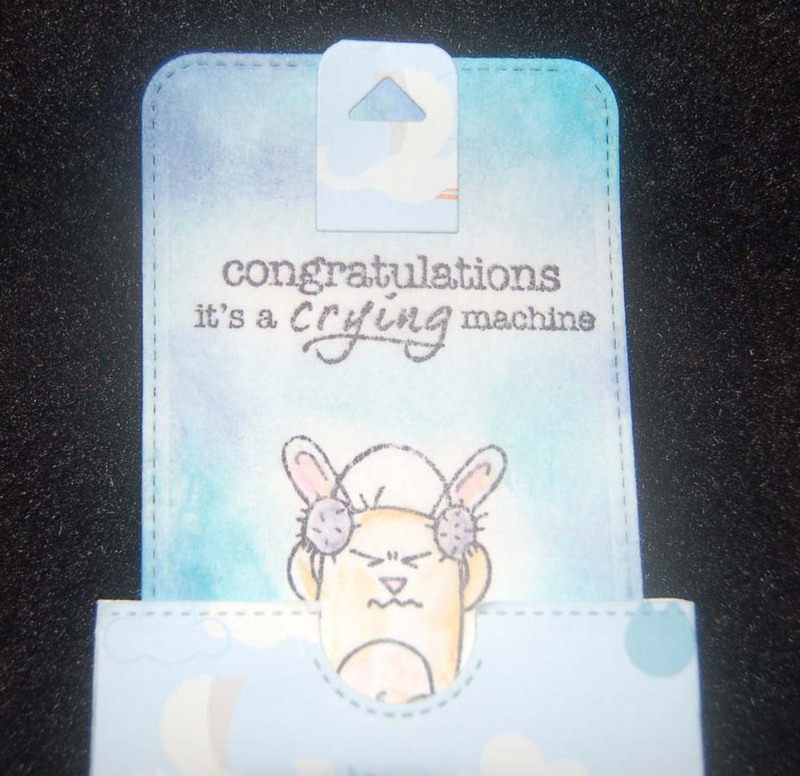 For the inside of the card (not shown) I stamped the Lawn Fawn 'merry' in silver ink and heat embossed it with NUVO embossing powder. 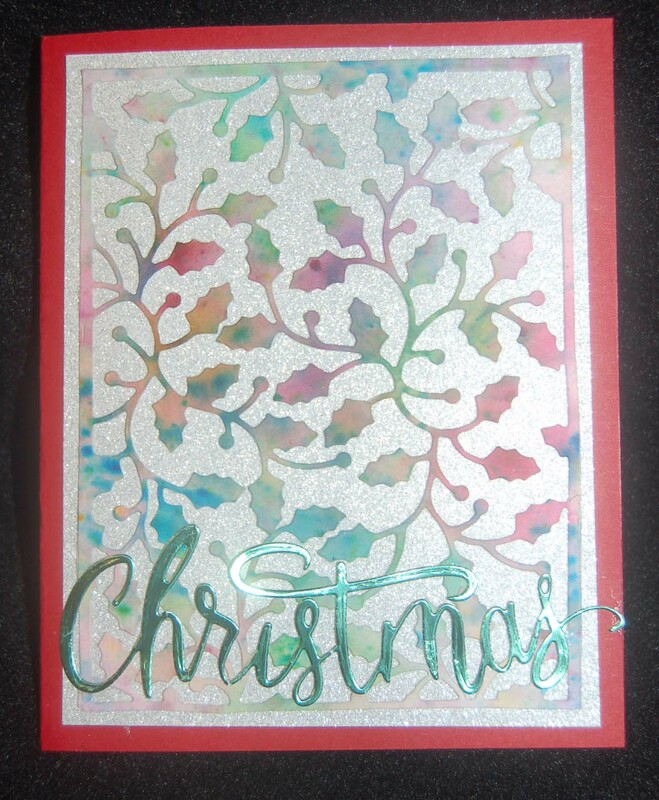 This card was fairly easy to execute except for applying the sticky adhesive to the back of the holly. I used the Xyron machine and it was a bit tricky to position the holly exactly. Maybe next time I will use a spray adhesive. 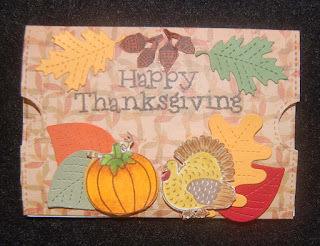 This card is for all of you in blogland. I want all of you to know how much I appreciate your visits and comments. I wish the best to you this holiday season and hope that 'Santa' is generous to you because I know you've been 'GOOD' all year! This past July we traveled to Hokkaido with some of our relatives. The tour bus stopped at a well-known lavender farm. Since I love the scent of lavender, I purchased some lavender oil, dried buds, and sprigs of real lavender. Way back in July, I was already planning to make soap to give to relatives at our annual holiday meal. I was so pleased to discover that HM Ben Franklin Crafts now carries a complete line of soap making supplies including the large loaf mold. I had to put approximately 40-50 drops of lavender oil and 30-40 drops of colorant in a batch (one tray) of microwavable goat soap base. 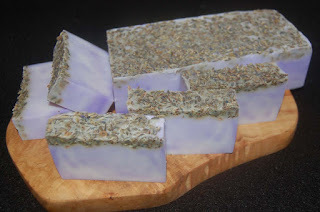 Before the soap hardened in the mold, I sprinkled on some lavender buds. 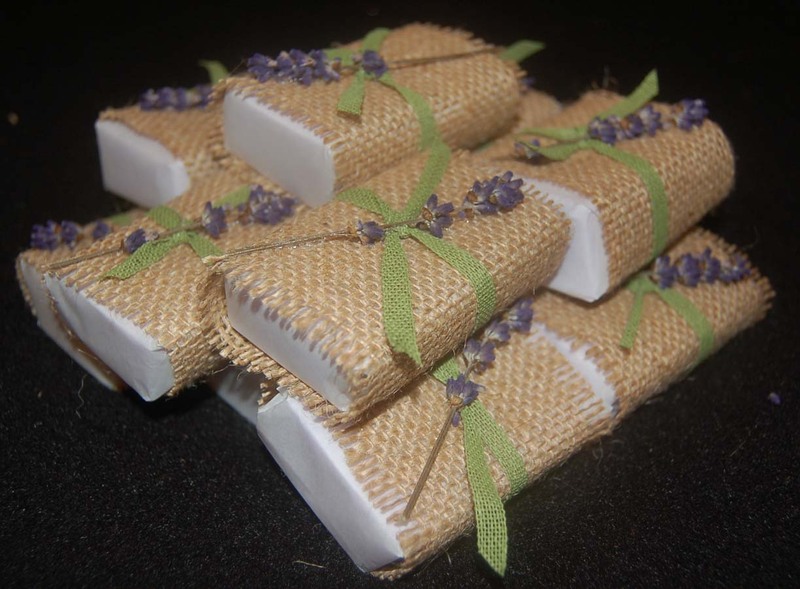 First, I cut the cooled soap and then wrapped the soap bars in parchment paper. 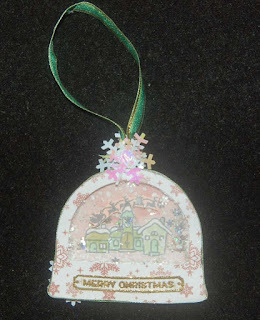 Next, I wrapped, glued and tied on burlap, Heiko ribbon and the lavender sprigs. (HM BFC has artificial lavender sprigs if you don't want to travel to Hokkaido to get real ones and there are lavender fields on Maui, too! This project turned out just as I imagined it would...a rarity in my world...AND I have weeks to spare before passing them out. Now that's a first for me! Hope your crafting is going merrily along! 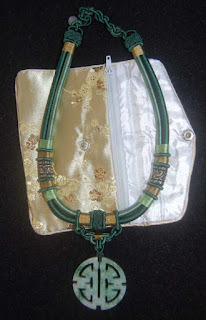 Several years ago I placed a jade pendant similar to this one in my locker box at HM Ben Franklin Crafts. 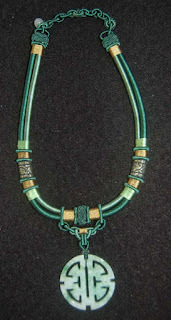 My son and his girlfriend admired it, but before I could take it out from my locker box to give it to her... it sold! I search long and hard to find another jade pendant and finally found an even better quality one at an antique show. Next I needed to find the cording in my jumble of jewelry supplies. 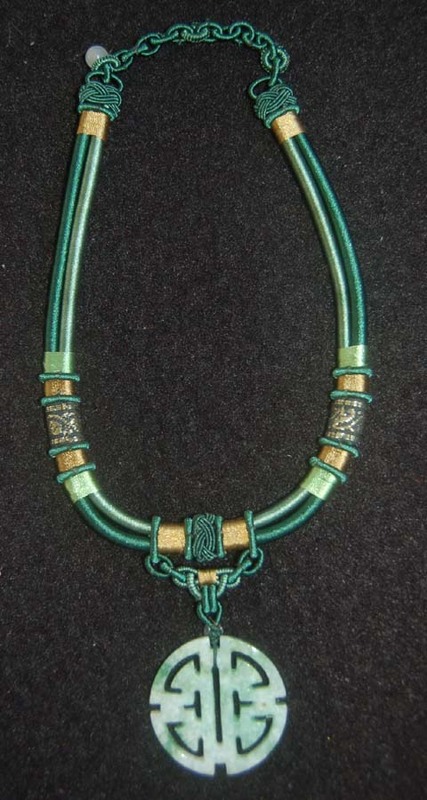 The corded necklace was purchased from HM Ben Franklin Crafts (or maybe Fire Mountain Gems) and just required tying (and gluing the knots) to affix the pendant. It was a simple project but with all the searching it took several years to complete. Finally, I can give it to the girl who is now my son's fiancee. 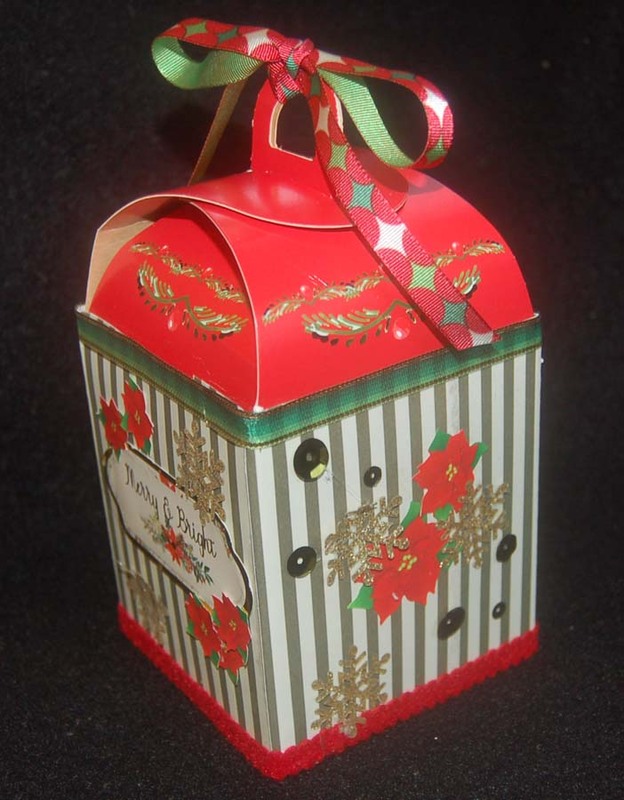 Hope you'll search the HM Ben Franklin Crafts locker boxes to find the perfect gift for that special person. Happy Christmas Shopping! 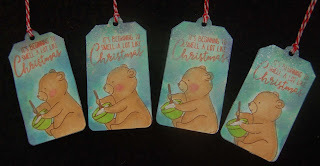 Its almost time to start baking my cookies for gift giving, but first I needed to make a stash of tags so I can quickly assemble the baked goodie bags. 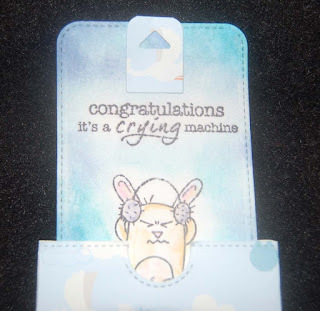 This year I discovered a really adorable Neat and Tangled stamp set which I used on the front of the tag before daubing Ranger Distress Oxide around the words and bear image. 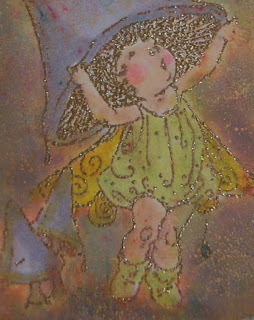 A little water was sprayed on before flicking (with a brush) on silver Liquitex ink. 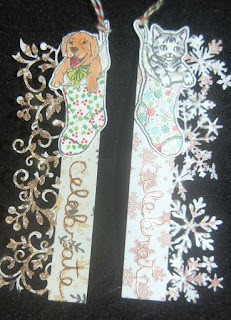 The bear image was colored with Copic pens This gave the look of light snow falling. Glossy Accents was added to the bowl and Bo Bunny Pearlescents white to the frosting. 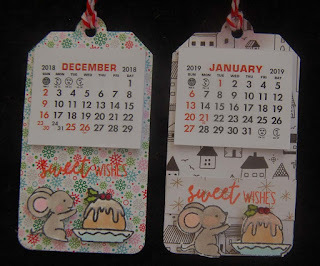 Because I always end up with a lot of extra Vippie mini calendars, I decided this year I would stick them onto everything, even tags....LOL! Recipients can always tie them to drawer knobs or hang them in the car ...much easier to find a date than searching on your phone. 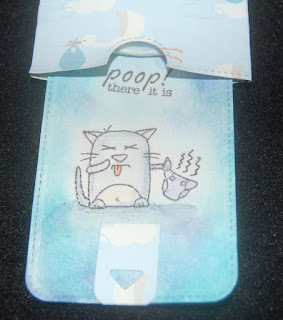 I added more cute images on foam dots to the tag backs. To give the tags a sweet fragrance, I rubbed some scented Honey Almond oil (from the HM Ben Franklin Crafts soap and candle making aisle) onto the red and white twine. 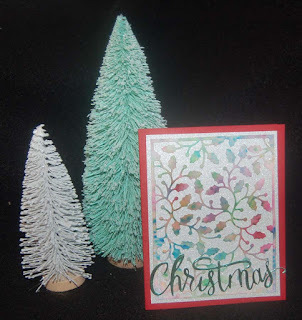 After using the snowflake paper on the calendar side of some of the tags, I decided since the calendar would be used all year I should put a non-holiday card stock on the back (like the one I found in the 6x6 Kaiser Craft paper pad). Too bad you can't smell my tags but I think you'd agree that scented tags really add to the excitement of Xmas goodie bags. Hope you make some scented tags and of course bake up some yummy treats for everyone! When I spied the Lawn Fawn 'Woodland Critters Huggers' die set I immediately thought of many uses for it. 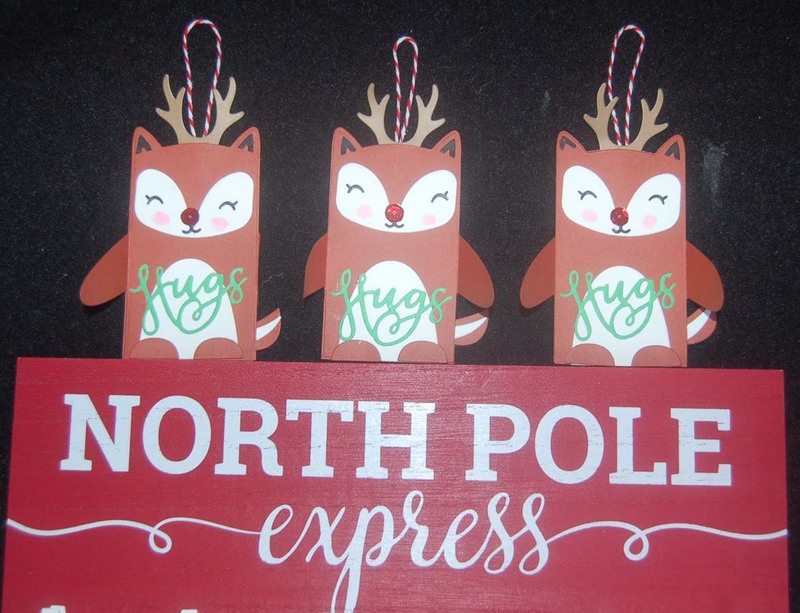 This set suggests three different animals you can make: 1) a reindeer 2) a raccoon and 3) a fox. 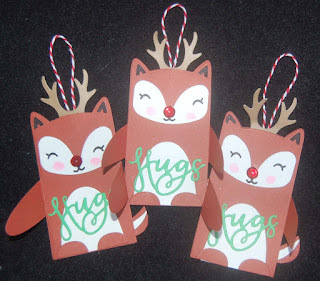 I think you can create others....this reindeer could be a chipmunk if you eliminated the antlers. 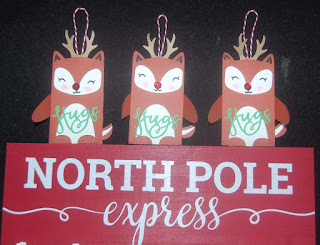 To make my reindeer a little different I added a red sequin for the his nose (Rudolph has always been my favorite. 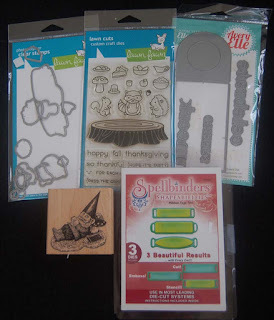 ), the green die cut Sizzix ' Hugs' and a red and white twine loop. I die cut a second brown body and cut off the arms so that the second body could be glued on to neaten up the back of the tag. Oh yes, a light pink Copic pen was used to add some cheek blush. I think this die set could also be adapted to make shaker tags or cards. I think I'll try that when I'm not so bogged down with holiday crafting. Keep working....it's almost Xmas! P.S. Did you know that Santa must have used female reindeer for his flight from the North Pole because the male reindeer don't have antlers during the winter? 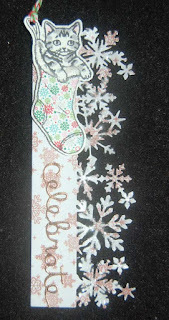 As promised, I've begun making Xmas gift tags. 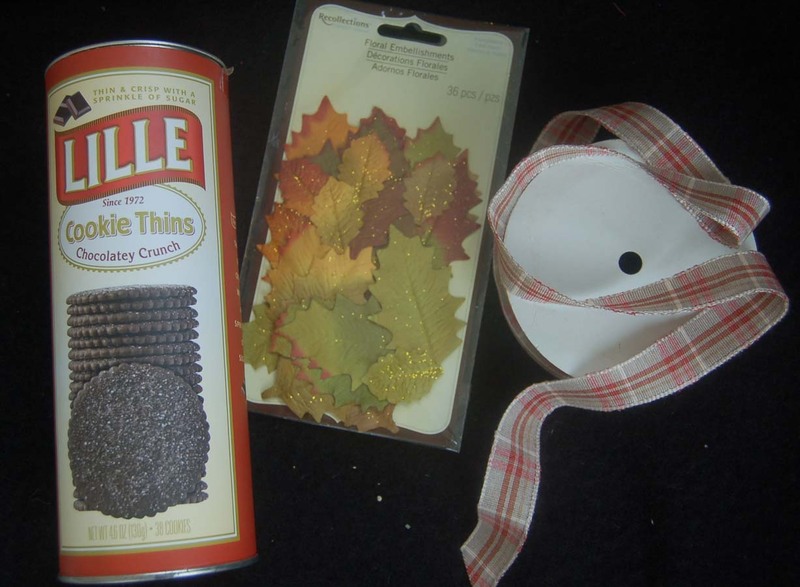 This year I was going for a different look, something fancy that would mean that I could attach it to a simple ribbon and forgo a bow. Since I had purchased some great new Xmas dies and stamps from HM Ben Franklin Crafts, I decided to use them in combination. The 6x6 Kaiser Craft Xmas paper pads provided the perfect papers for die cutting the snowflake base for the kitten and the holly base for the puppy tag. To add a little sparkle I glued on some Martha Stewart clear crystal glitter to the snowflakes and gold sparkle glitter to the holly berry sprigs. (Look at the tags close up.) The Kaiser Craft paper pads also had some foil papers which were used to die cut the Lawn Fawn 'celebrate'. The animals were colored in with Copic pens and the stockings were paper pieced by die cutting them out of a second piece of printed card stock. 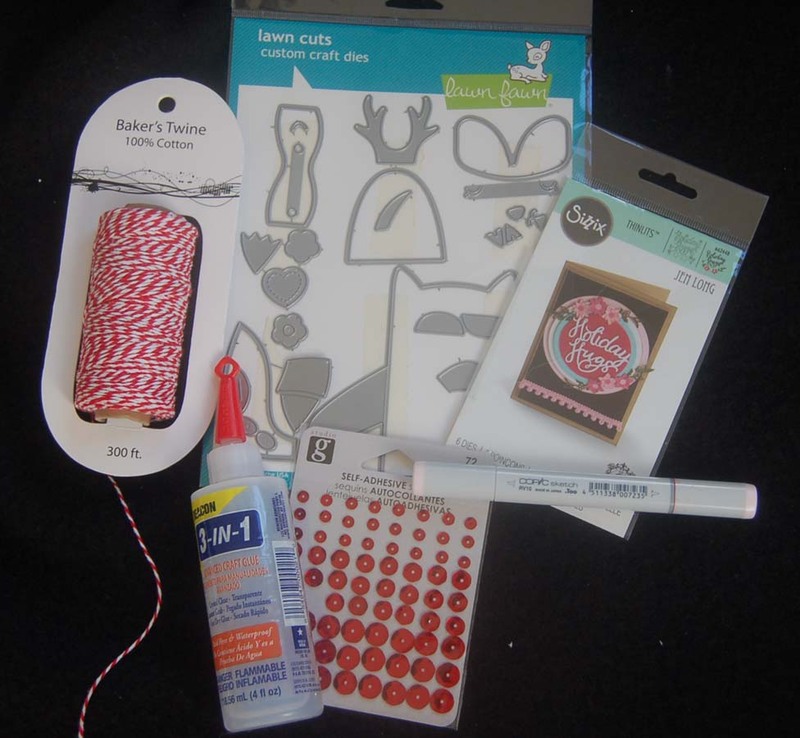 Final touches were added by Fun Flocking the stocking cuffs and tying on some red and green twine. 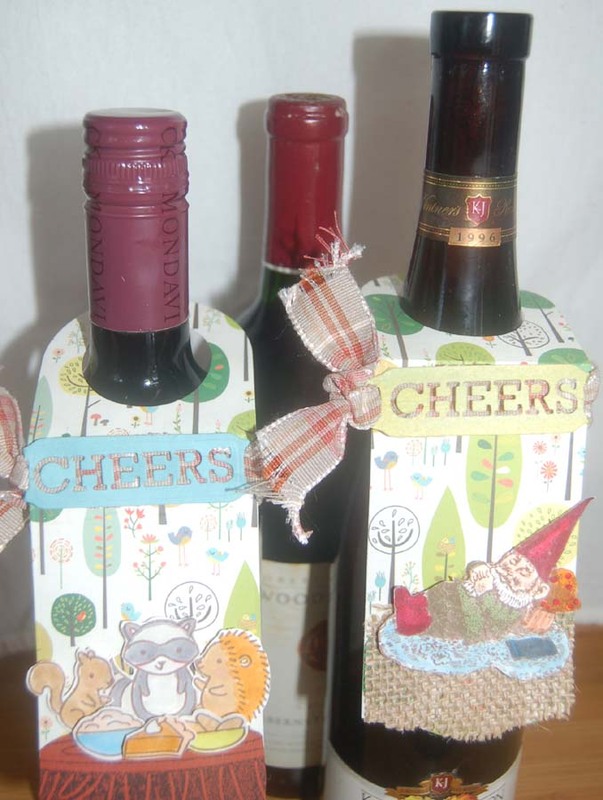 You can (as I did) make a bunch of these to dress up your wrapped gifts. Hope this post has given you a new take on the traditional Xmas gift tags. 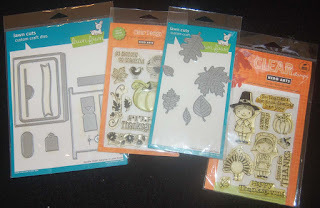 Leave me a comment if you aren't too busy with holiday preparations. Happy Holidays! The fall season is probably my favorite one because the weather gets cooler and the traditional colors are such a pleasing palette. 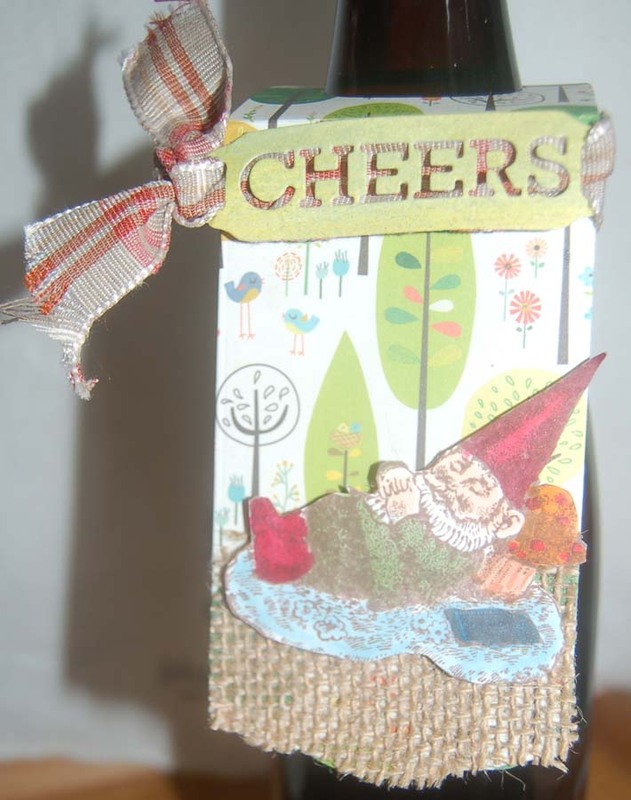 This double slider card (Lawn Fawn die set) is my first attempt so I am really proud that it actually works! 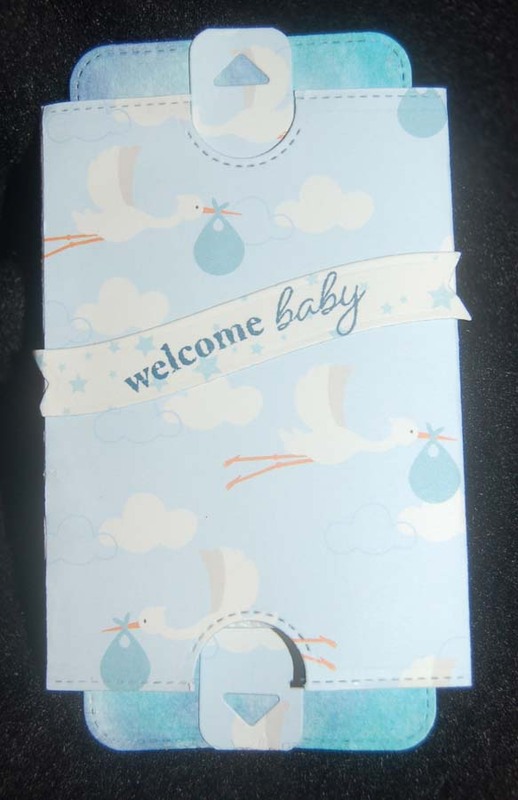 I kept the decorations and sentiments simple so I could concentrate on the mechanics of the card. After watching the Lawn Fawn video a few times, it wasn't difficult to assemble the double slider card. 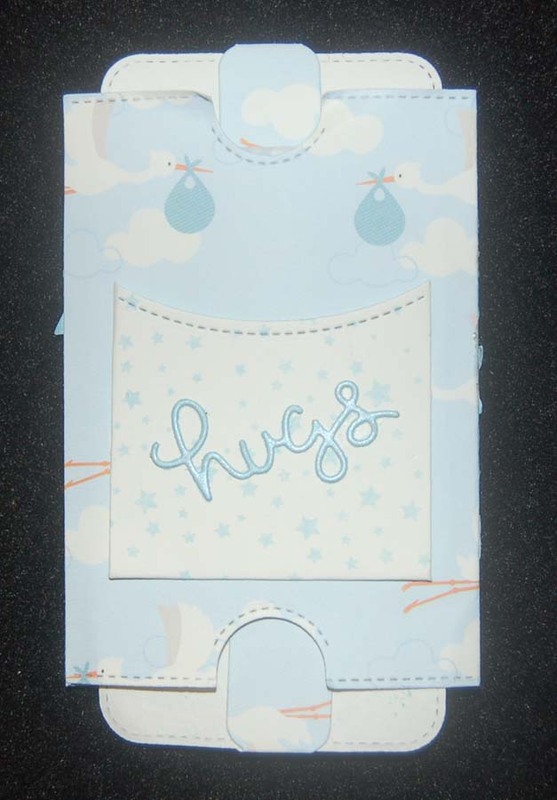 I am so pleased by this card form that I will definitely be making more perhaps as gift card holders or calendars. 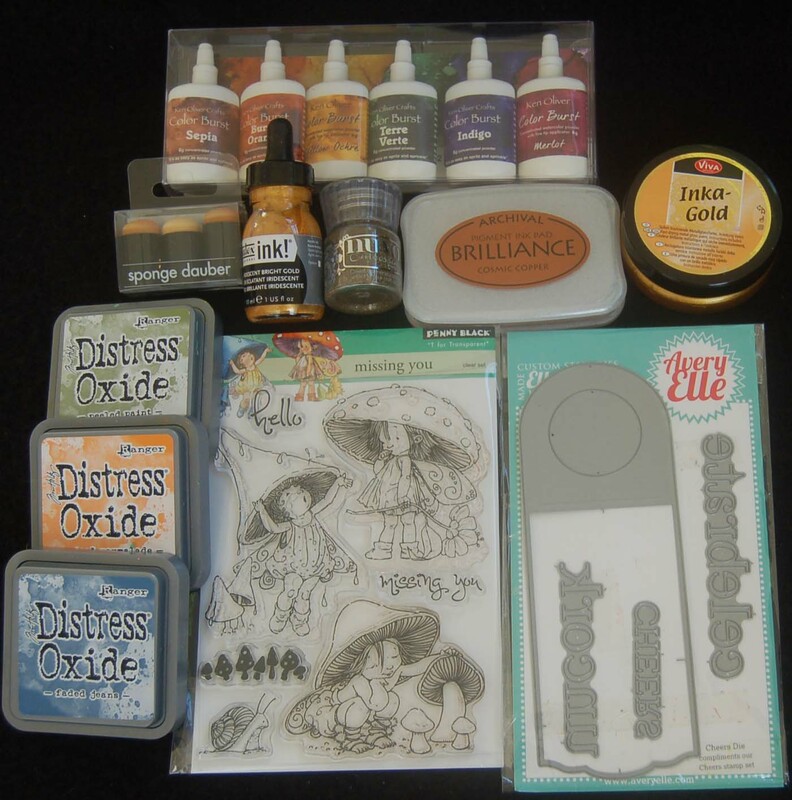 Please stop by again to see what I create with this unique die set. 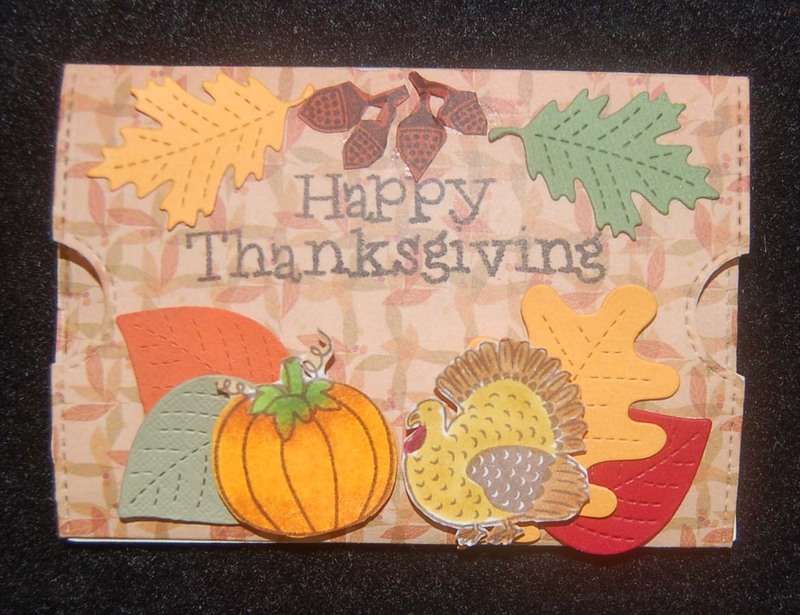 Happy Thanksgiving to all my friends in blogland! 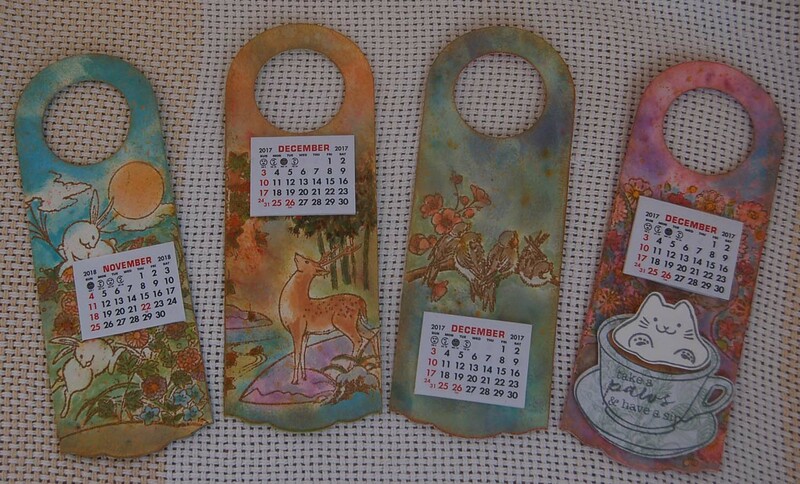 Basically, these calendars were made using the same process and supplies described in my last post. Although time consuming, I enjoy heat embossing the stamped image and applying the free flowing Oxide Distress Inks which pair well with Copic pens that I use to add in extra filler color. 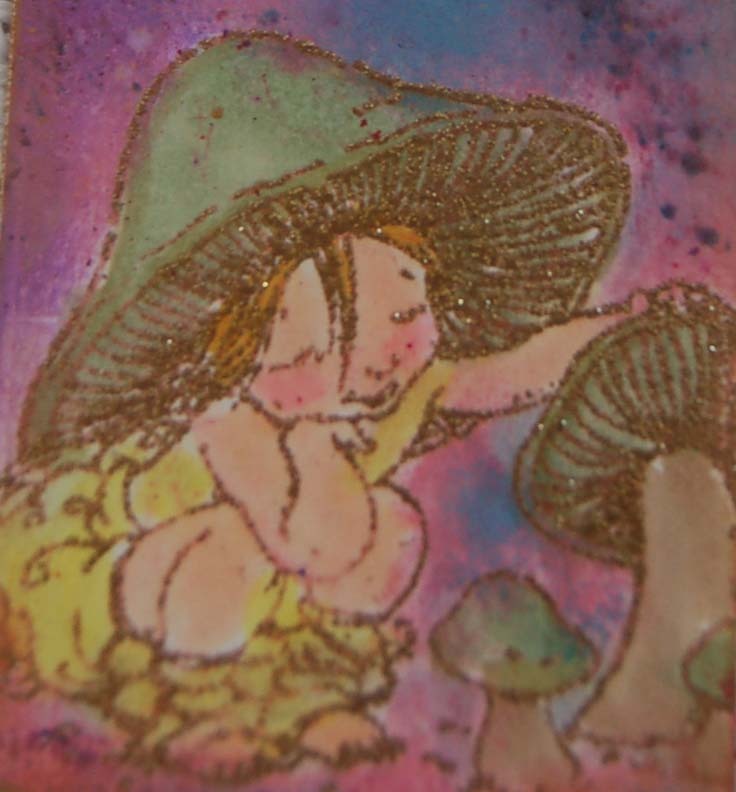 Not all of the stamp image has to be used as seen with this cropped design which allows more of the Oxide Distress ink watercolors and gold flecked ink to show. 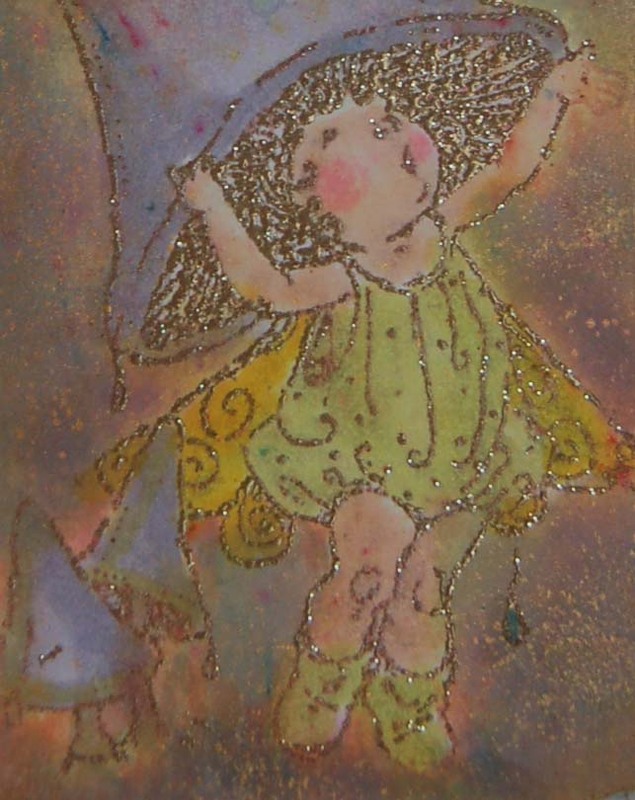 The images on these calendars have been heat embossed with copper ink and Nuvo brilliant gold powder so they really have a nice sparkle. Unfortunately, these photos don't show this aspect but you can see in the previous post what a nice effect results from this technique. 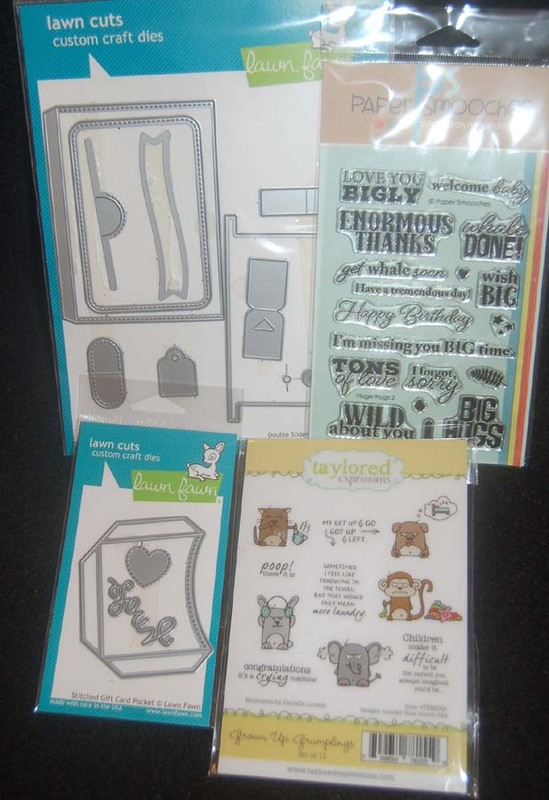 This last one does not match the others because the whip cream kitty in the cup (Hero Arts stamp and die set) was an add on to cover up a 'boo-boo'. LOL! 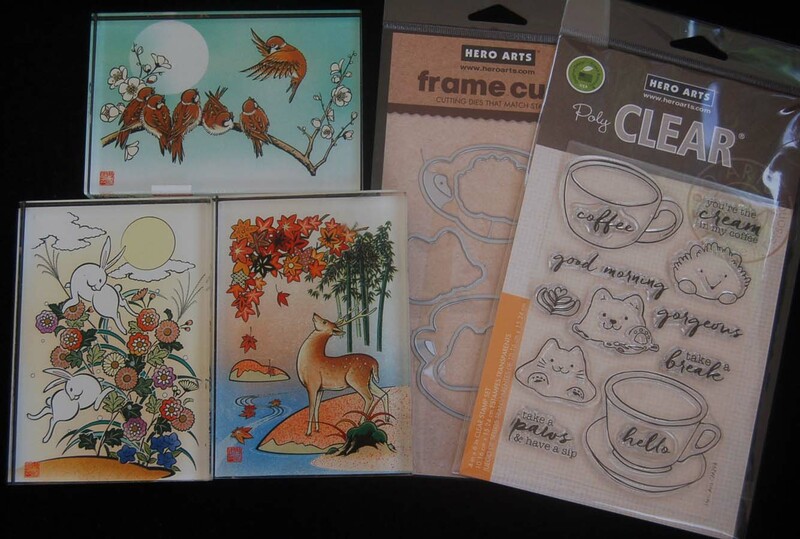 I like that what I almost threw away turned out quite attractive and perfect for a coffee-loving cat person. 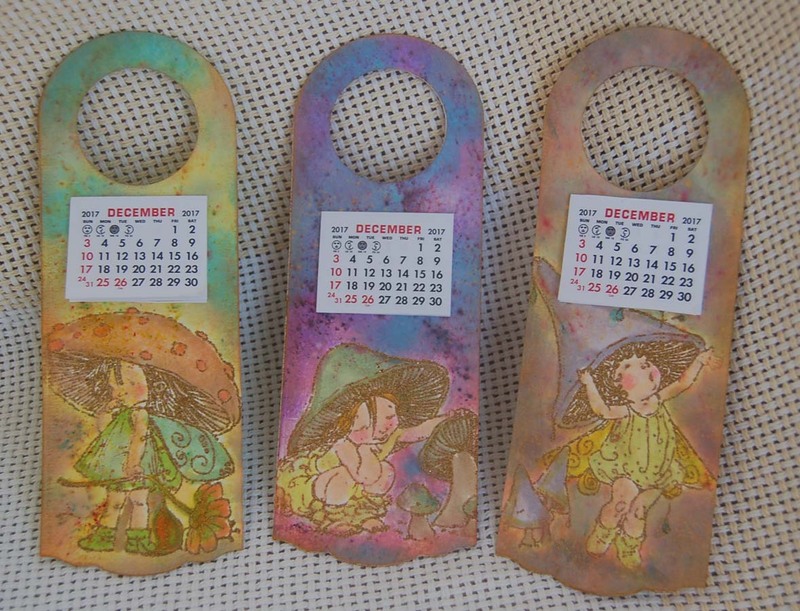 I hope I haven't bored you with yet another set of hanging calendars. 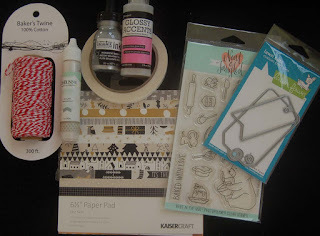 I promise the next post will be something different....maybe it's time to start some Christmas crafting! After making the wine bottle tags featured on my last post, I felt that the hanging tag die could be used to make hanging calendars. The images from the Penny Black 'missing you' set seemed perfect for this project. 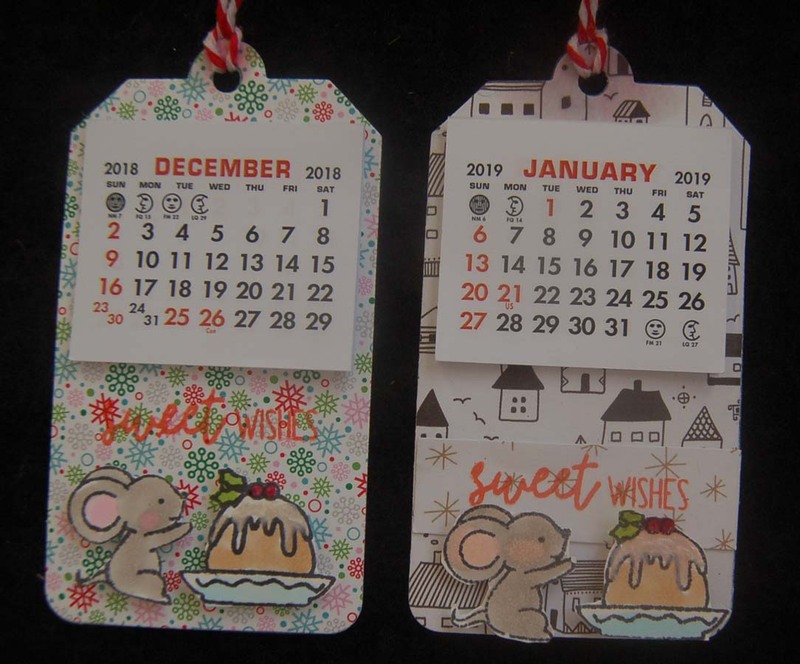 I wanted the hanging calendars to be one layer (except for the calendar part) and I wanted the backgrounds to be a flowing blend of colors. 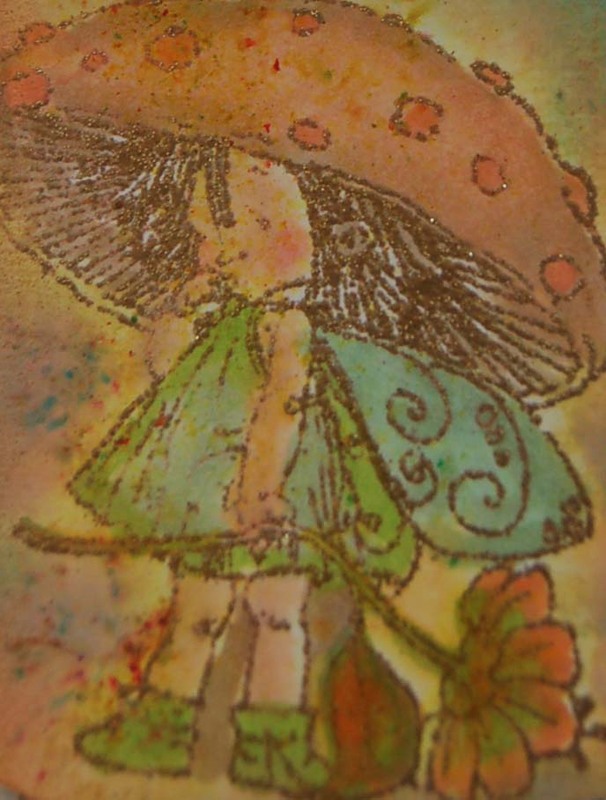 I started by stamping the images on die cut watercolor paper using Brilliance copper ink and sprinkling on Nuvo Gold Enchantment embossing powder before setting with a heat gun. 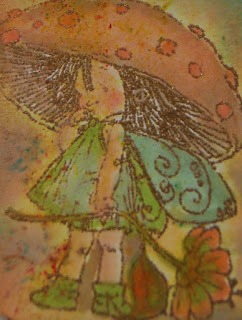 Next I used a sponge dauber to apply and blend some Distress Oxide Inks (Ranger) around the main image. After spraying water and blotting, I applied more color and some Ken Oliver pigment powder and sprayed again until I was satisfied with the look. Then, I colored in the images with Copic pens.Using my finger and a stiff paint brush, I flicked gold ink (Liquitex) over the whole surface. 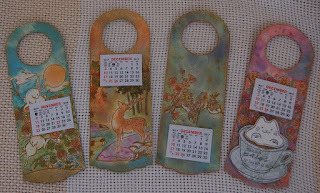 Finally, I die cut a printed card stock to adhere to the back of the hanging calendar. 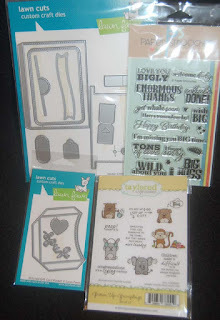 It was easy to find a matching card stock in my sky high pile of scraps LOL! 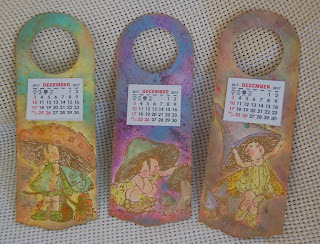 Oh yes, I rubbed some Inka-Gold paste to the edges of the calendar to give it a more finished look. If the recipient of the calendar needs to fit it over a doorknob, a slit can be made through the lower side of the ring. These calendars are so easy to make that I plan to make a few more to accommodate the many 2019 Vippies I just ordered. 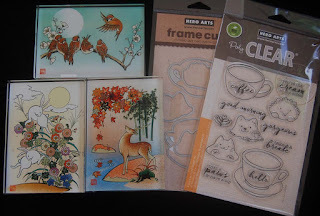 Just a short post today. I have a bunch of these empty cookie containers....hmmm where'd the cookies go? 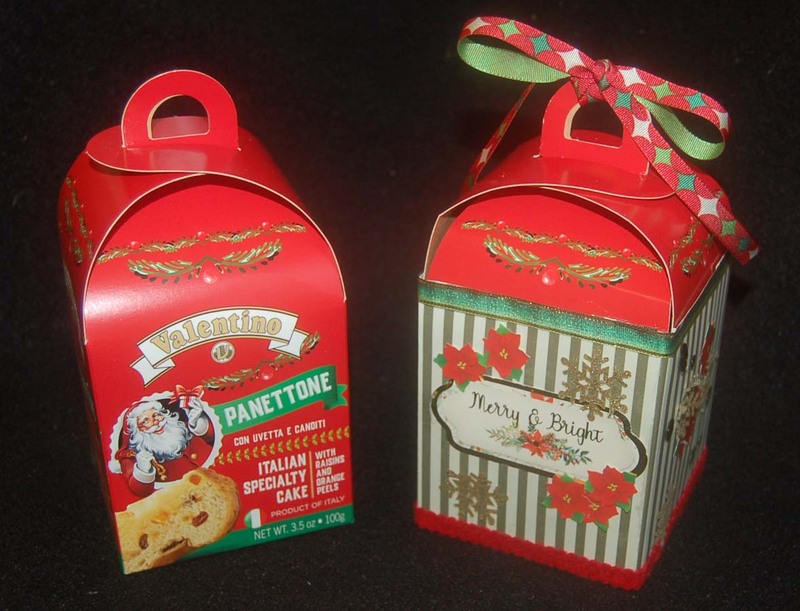 They are sturdy and just the right size for recycling into homemade cookie, soap or bath fizzy bomb hostess gifts. 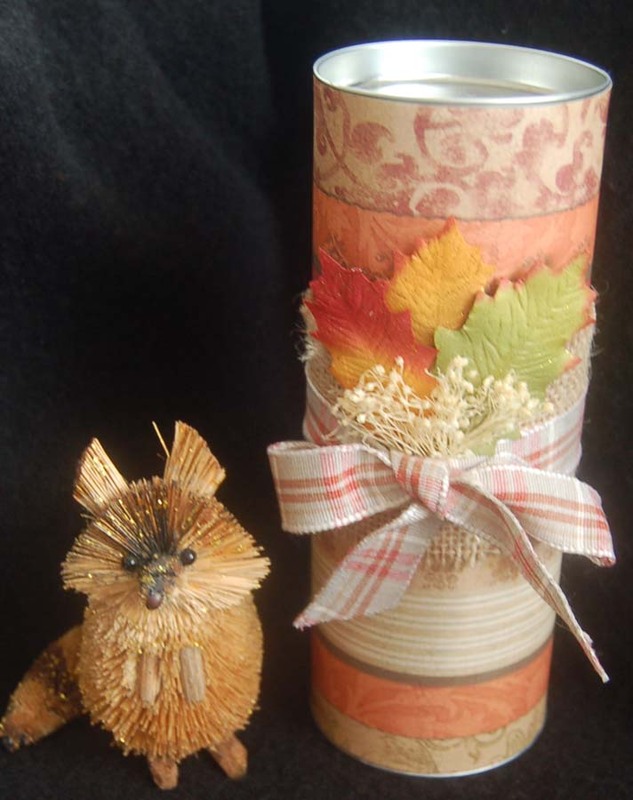 It was so simple to use double stick tape to attach printed stripe autumn paper to the outside of the cylinder and add a strip of burlap, ribbon, leaves and a dried baby's breath sprig. You can find a large supply of these autumn items at HM Ben Franklin Crafts. As with the box on my previous post, this decorated container can be useful after the contents are used up. 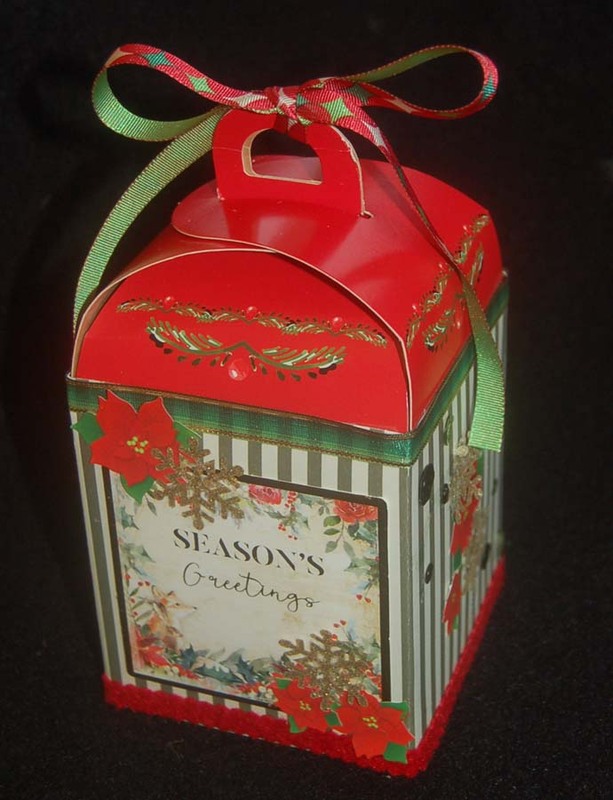 With a calendar on the back, this tall box can hold scissors, pens, pencils, etc. and look attractive on an office desk. Enjoy the season of giving!